Contest to celebrate the release of The Covert Wolf! It's release day for The Covert Wolf! And I'm holding a special contest. First, this is the cover for the Mills and Boon version. It will be released in the UK in September. You finally get to see Matt's face! And to order The Covert Wolf in the US on Amazon, click here. To order The Covert Wolf on Barnes and Noble, click here. Pop over to my Facebook page by clicking on this link. Now, look through my page (please "like" it while you are there) and look through the various photos of The Covert Wolf on his "book tour." Answer this question: What year is the NASCAR sticker on the car The Covert Wolf chose as his vehicle to pursue demons? Hint: It was posted on July 13, so you'll have to scroll down. Two lucky winners will each get a paperback copy of The Empath, my first Nocturne, which is now out of print. 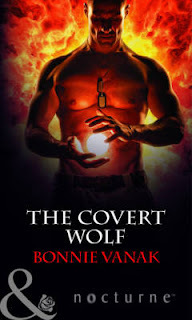 Contest ends August 10, 2012.
Review for The Covert Wolf! 4.5 stars from CataRomance! Woo hoo! The Covert Wolf is in bookstores on Tuesday, July 24! If you haven't seen the fun "tour" I've been doing with the book, please check out my Facebook page. “Since the mystique associated with werewolves has always fascinated me while the risky exploits of SEALS also intrigues, I was very excited to discover how the two would be blended in the first book of the Phoenix Force miniseries. Bonnie Vanak certainly does not disappoint in her latest Harlequin Nocturne story, as emotions, conflict and peril escalates. There are eight men in the special Navy SEAL team to which Lieutenant Matthew Parker belongs, and the Draicon werewolf is proud to serve his country. All members of the Phoenix Force squad have paranormal abilities, so they are better able to battle other supernatural beings who would terrorize unsuspecting humans. Unfortunately, a good friend serving with him is killed by demons when the two are setup, and Matt vows revenge against those responsible. The same demons are seeking the powerful Orb of Light, so he is doubly intent on finding them and keeping their destructive plans from becoming reality. 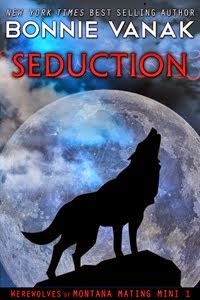 While Sienna McClare has agreed to work with a SEAL in order to retrieve the Orb, she had no idea the person would be a Draicon werewolf, a race of beings that she despises. Since she is a hybrid, the family by whom she was raised has abandoned her, and she believes locating the ancient object would get her back in their good graces. 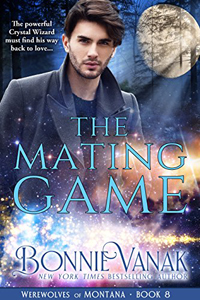 Matt and Sienna need each other to reach their goals, and they soon realize the connection between them is also very crucial to their future wishes. Bonnie Vanak is an author of innovative paranormal books. Her previous stories about supernatural beings have been inventively unique, and the Phoenix Force miniseries has additional out-of-the-ordinary features. Taking the real life profession of a Navy SEAL and giving these brave individuals traits that cause them to be even more powerful is a noteworthy premise, and Ms. Vanak makes every aspect of the story frighteningly believable. Could the malevolence that takes place during war sometimes be caused by demons and not ordinary humans? While the SEAL activities at the start of the story come across as possible, the rest of the book is just as conceivable. There are a number of situations where supernatural capabilities come into play, and regardless of the species, their talents seem very natural. Although every member of the SEAL team is not human, there is still camaraderie amongst them like regular soldiers, and these moments sometimes had me smiling and definitely sensing their friendship. I am already eager for more of their stories! The relationship between Matt and Sienna is totally realistic, as they both have dreams yet see no way for them to become an actuality. Their heartaches are so genuine, and any happiness practically leaps off the page because of affecting feelings. I adored these two individuals with their compassionate natures, and I saw Matt as a true hero on so many occasions as the safety of others came first. The sexual awareness they each felt is intense and causes plenty of tension, and when they finally express their inner feelings, the scene is beautifully sensual with fiery heat. There are a few surprises to be learned before everything concludes, and I was shocked by almost all of them. Several characters from past Bonnie Vanak books make an appearance, and they enhance the story whether you have read about them or not.